CHICAGO--(BUSINESS WIRE)--Enjoy Life Foods, the #1 brand in the Free-From food category, has become the first food company in the U.S. to receive Palm Oil Free Certification for its newest product launches from the International Palm Oil Free Certification Accreditation Programme (POFCAP). The brand’s new Grain & Seed Bars, the only bars on the market to combine three types of the ancient grain sorghum, are the first to receive the certification; and its plant-based Protein Bites will follow in June, for a total of eight SKUs in all. Palm oil is the most used vegetable oil in the world, according to World Wildlife Fund, and is found in everything from ice cream to laundry detergent. Unfortunately, conventional production has resulted in significant negative environmental and social impact, including large-scale deforestation that’s endangering the future of orangutans. In 2017, The New York Times reported that the Bornean orangutan’s population had declined by more than 80 percent in the last 75 years largely because of habitat loss. That’s why Enjoy Life made a commitment early on to use Roundtable on Sustainable Palm Oil (RSPO) Certified palm oil and has now taken a step further to achieve Palm Oil Free Certification. For existing product lines that use palm oil, RSPO Certification contributes to the production of sustainable palm oil and limitation of negative impacts to the environment sourcing. No stranger to setting new industry standards, Enjoy Life was also the first brand to achieve Gluten Free Certification by the Gluten-Free Certification Organization (GFCO) for all of its products, and has a full portfolio of 70+ foods that are Non-GMO Project Verified, OU Kosher and free-from 14 allergens (wheat, peanuts, tree nuts, dairy, casein, soy, egg, sesame, sulfites, lupin, mustard, fish, shellfish, and crustaceans). Almost 90 percent of its products are Certified Vegan. Enjoy Life Grain & Seed Bars retail for $4.69/box of five one-ounce bars, while Protein Bites retail for $6.99/6.4-ounce bag. For product inquiries and sales orders, please contact Sales@EnjoyLifeFoods.com. To learn more about Enjoy Life Foods and its ingredients, visit www.EnjoyLifeFoods.com. Enjoy Life Foods is the leading brand in the growing Free-From category, featuring a robust portfolio of Certified Gluten Free and Non-GMO Project Verified products that are free-from 14 allergens – wheat, peanuts, tree nuts, dairy, casein, soy, egg, sesame, sulfites, lupin, mustard, fish, shellfish, and crustaceans. 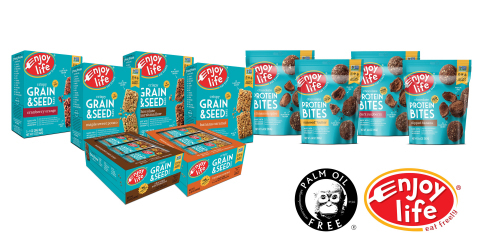 Founded with the goal to create great-tasting, allergy friendly foods, the Enjoy Life line includes cookies, snack bars, chocolate bars, baking chocolate, baking mixes, seed and fruit mixes, protein bites and lentil chips, all available in natural and conventional grocers and mass retailers throughout the United States and Canada. Enjoy Life’s mission and brand promise is to deliver safe, better-for-you products free-from common food allergens, but not free-from taste so everyone can Enjoy Life and Eat Freely! To learn more about Enjoy Life, visit www.EnjoyLifeFoods.com, ‘Like’ us on Facebook, or follow us on Twitter, Instagram, Pinterest or Snapchat. POFCAP is the first International Palm Oil Free Certification Trademark and Certification Programme. POFCAP launched in 2017 in Australia and has since spread worldwide. POFCAP certifies products as to their palm oil free status. Two of the programme’s aims are to assist the consumer when shopping for genuine, independently assessed palm oil free products and distribute 100% of profits from the programme to NGO’s working to support animals and rainforests. For further information please go to www.palmoilfreecertification.org. Enjoy Life Foods has become the first food company in the U.S. to receive Palm Oil Free Certification for its newest product launches.